Find Stella Maris Real Estate Listings on Long Island below! Located at the northern end of Long Island in the Bahamas you'll find the quaint village of Stella Maris. Real estate here can be described as great value. Ocean view property can be found with elevations up to 160 feet above the Atlantic. The settlement of Stella Maris is quiet, peaceful, enjoying its view over the dark blue Atlantic Ocean. About one hundred hilltop residences and seaside properties take up about 2000 acres here. Stella Maris has been known for years to be the vacation spot for Bahamas getaway for private pilots, scuba divers, family vacationers, and fishermen. Browse Stella Maris real estate listings or read more about diving with the sharks below. 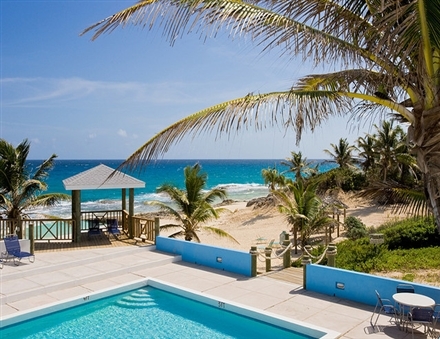 Stella Maris Resort is an quiet oceanfront resort offering everything from lots to luxurious waterfront homes. Commercial real estate in Stella Maris consists of properties ranging in size from 11,000 sq. ft. to many acres. Westward views from hilltop real estate take in Great Exuma, while views eastwards are towards Europe across the endless Atlantic Ocean. Stella Maris is famous for it's diving and water sports and has a full service oceanfront marina that can accommodate boats up to 100 feet in length. Underwater real estate takes on another dimension when you take at dive at Stella Maris Shark Reef. This famous spot has been documented on many nature programs on the National Geographic channel and Animal Planet. Shark diving at Stella Maris is one of the most exhilarating experiences possible and is just one of the pleasures of living in Stella Maris. The community has an international airport with a fully paved runway that can accommodate most small business jets. Have a property in Stella Maris you're looking to sell? You can find out what it's worth using our online home evaluation tool!